Chemical methods have been used for the remediation of arsenic (As)-contaminated water; however, ecological consequences of these methods have not been properly addressed. The present study evaluated the effects of the Fe-oxide-coated sand (IOCS) remediation method on As toxicity to freshwater organisms (Lemna disperma, Chlorella sp. CE-35, and Ceriodaphnia cf. dubia). The As removal efficiency by IOCS decreased substantially with time. The IOCS remediation method was less effective at suppressing the toxicity of AsV than AsIII to L. disperma but was highly effective in reducing both the AsIII and AsV toxicity to C. cf. dubia. The growth of Chlorella sp. 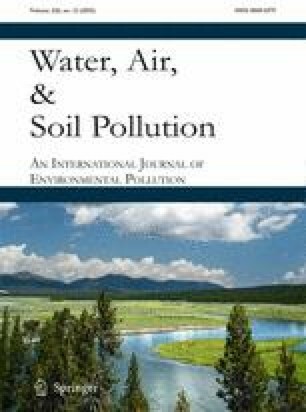 was significantly higher (p < 0.05) in remediated and pre-remediated water than in controls (non-As-contaminated filtered Colo River water) for AsIII, while the opposite was observed for AsV, indicating that AsV is more toxic than AsIII to this microalga. Although the IOCS can efficiently remove As from contaminated water, residual As and other constituents (e.g. Fe, nitrate) in the remediated water had a significant effect on freshwater organisms. This research was supported by University of Technology Sydney (UTS) through Chancellor’s Postdoctoral Research fellowships to Dr. M. A. Rahman and Dr. C. Hassler. We acknowledge financial support from the Cooperative Research Centre for Contamination Assessment and Remediation of the Environment (CRC-CARE project 3.1.3.11/12), Australia. Financial support also provided by the Ecochemistry laboratory, University of Canberra, Australia. We would like to thank Dr. Anne Colville at UTS for technical support in the conduct of the experiments, Ms. Merrin Adams and Ms. Monique Binet of the Commonwealth Scientific and Industrial Research Organisation (CSIRO), Australia for providing the freshwater phytoplankton, and the Ecotox Services Australasia Pty Ltd. for providing the cladocerans.